What is your #cherished object? Last month, the #CHERISHED blogfest was born. This weekend, bloggers across the world are invited to share stories about one little item that they possess which brings them joy. My little cherished item is a turquoise charm that I bought one year while traveling extensively all over the US. During my travels, I became worn out and sick. 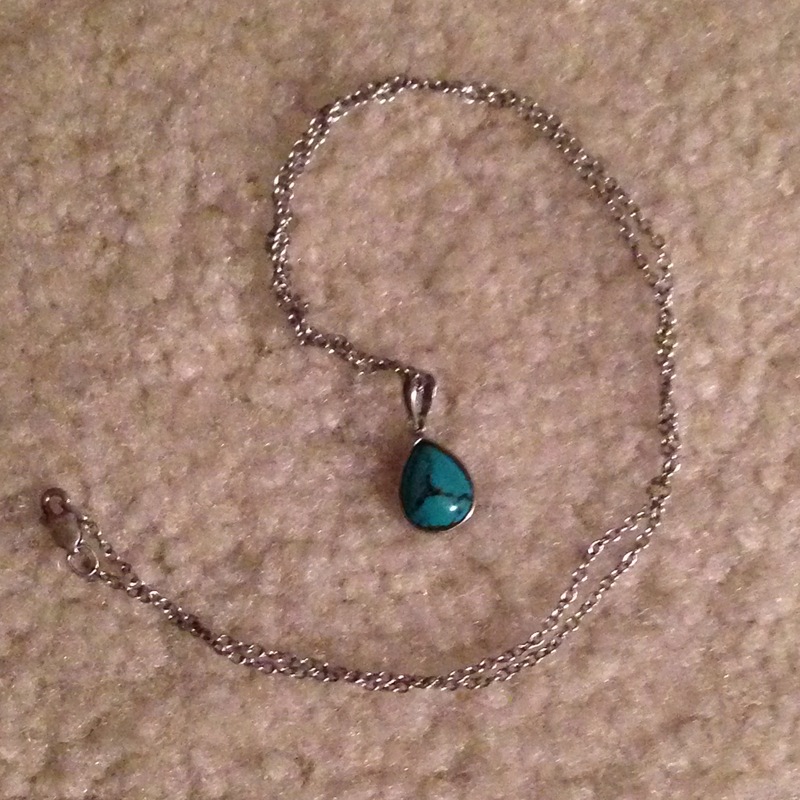 A dear friend of mine, out of deep concern, suggested I carry a piece of turquoise while traveling. She, being one who believes that nature provides all we need to heal, indicated that the stone’s properties are for protection, healing, and grounding. All aspects that I needed in my life at the time. Not owning any turquoise of my own, I stumbled across a little gem at the Baltimore airport during a long and unexpected layover. I was exhausted, cranky, and wanted nothing more than to just curl up in my own bed. As a distraction from my exhaustion, I decided to kill time by walking through one of those fancy jewelry stores that airports use to entice one to spend money… because one has nothing better to do while waiting for their connecting flight. Upon entering the store, I was immediately drawn to a little blue stone that seemed to emanate some kind of energy. A beacon that instantly drew me in. I am usually not one to spend money on jewelry, but there was something about the blue of the turquoise that captivated me. Something inside my head said to splurge, and so I did. As much as this necklace is a symbol of protection and health, as my dear friend Susan says it is intended to do, the stone actually means something more. I obtained this piece of turquoise in the midst of an eventful year traversing the US. And as such, this charm serves as a reminder. A reminder that there is a huge world out there, and I have only seen 15% of it. A reminder that I need to stop letting time pass by and achieve those dreams that I aspire to reach: Travel, publication, enjoying life to its fullest. Everytime I look at this little blue charm I see our world, Earth, the planet that I yearn to explore and to write about. 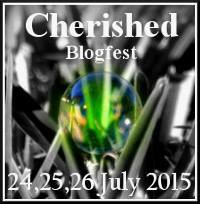 Are you taking part in the Cherished Blogfest? If you are, this weekend (24-26 July) please post about your cherished object, and visit others on this LINKY LIST. Share on all social media with the hashtag #CHERISHED. If you haven’t signed up yet, you still can. The linky list is open for two more days. What is an object you cherish? What sort of memories does it bring back? What does the object mean to you? Write about your #CHERISHED object in 500 words or less! This entry was tagged Blogfest, Cherished. Bookmark the permalink. Thank you Amanda for helping spread the word about the Cherished Blogfest and for contributing such a wonderful story. What a great find (in such an unusual place). I’ve spend many a long layover at that airport. Maybe the next time I’m stuck there, I’ll explore a little further from my gate. Thanks, Dan! I wish I could remember the store’s name, but it is near the Southwest Terminal. It is a store I had never seen in an airport before. I’ll dig around and see if I can come up with the name. They had a lot of unique jewelry and gemstones (NOTE: not Red Horse or at a kiosk). I like that a lot. I knew a guy who carried a smooth pebble, no bigger than a pea. He said it was a piece of home. Thank you! I enjoy hearing about the little items that people carry to remind them of where they are from, where they have been, or where they are going. Thanks for sharing about your friend’s pebble. Beautiful reflection Amada, thanks for sharing. It’s probably not coincidence that those cherished most often point to reminders, those indelible memories that hold so much meaning in our lives. For me, aside from my car (which I suppose is not a “little” object), I would have to say my cherished object is the 101 Dalmatians mug that sits in my cupboard. Even when it is buried deep in the back, it is the one I reach for each morning when I fill it with coffee. It points to all the wonderful reminders of time spent at Disney – by myself, with my family as a kid, with my wife, my son. Not only that, it seems to also provide me with a constant dose of a mental adrenaline to keep reaching for my dreams, goals, and aspirations, no matter how far-fetched they may seem. Thanks for bringing those memories and reminders back to light, Amanda 🙂 Have a great weekend! What a lovely object you cherish. It is beautiful how it connects you with your family, wife, and son along with your dreams and aspirations. Thanks for sharing that, Dave. Hope you had a fabulous weekend! Thankyou for participating in the Cherished Blogfest, Amanda. Such an unusual, charming object, and such a beautiful reminder you gave yourself with it. Thank you for organizing the Cherished Blogfest. I really enjoyed it and hope there will be another one. The stone is lovely, and the blue adds to its beauty. It’s your Talisman and it should bring you good luck. Thank you for participating in the #Cherished blogfest, and for sharing such treasured memories. Cheers! Thanks for the invitation, Peter! I enjoyed participating and reading all the other posts.